WEST WINDSOR – The Board of Trustees of Mercer County Community College (MCCC) tonight announced the retirement of Dr. Patricia C. Donohue as Mercer’s fifth president, effective June 30, 2015. In commenting on President Donohue’s departure, Board of Trustees Chair Dr. Gwendolyn Harris said it was with mixed emotions that the Board accepted Dr. Donohue’s retirement. 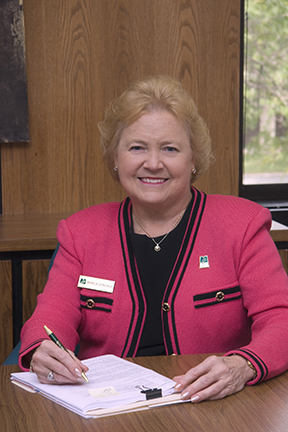 President Donohue came to MCCC from her presidency at Pennsylvania’s Luzerne County Community College in February 2007. In her eight years at Mercer, Dr. Donohue has lead important initiatives at the college that include the establishment of the College’s Office of the First 30, which emphasized connecting with students for orientation and coaching, to remove barriers, and support their successful completion. She is known for the first Facilities Master Plan since the West Windsor campus was built in 1972, the expansion of the Trenton Campus in both facilities and services to students, and regular three-year Strategic Plans, all of which included community input. She also instituted the College’s Leadership Academy, now in its fifth year, to develop leadership skills among the college’s faculty and staff. Mercer County Community College President Dr. Patricia C. Donohue. Dr. Donohue places student success above all other priorities at the college, and she has guided the Board of Trustees, the faculty and staff to join her in this single focus, thus creating a culture that fosters and values student achievement throughout the college. The Board of Trustees has selected a nationally-known academic search consultant, the Pauly Group, to lead the search for President Donohue’s successor. President Donohue will continue to lead the college until June 30, 2015. The college will celebrate President Donohue’s leadership tenure at MCCC with events in the spring of 2015.